World Weaver Press, 9780998702223, 174pp. 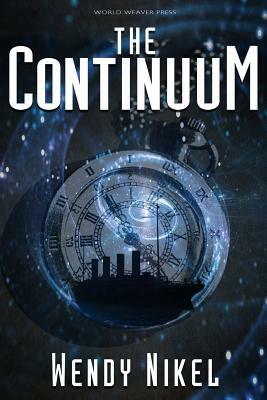 For years, Elise has been donning corsets, sneaking into castles, and lying through her teeth to enforce the Place in Time Travel Agency's ten essential rules of time travel. Someone has to ensure that travel to the past isn't abused, and most days she welcomes the challenge of tracking down and retrieving clients who have run into trouble on their historical vacations. But when a dangerous secret organization kidnaps her and coerces her into jumping to the future on a high-stakes assignment, she's got more to worry about than just the time-space continuum. For the first time ever, she's the one out-of-date, out of place, and quickly running out of time. Wendy Nikel is a speculative fiction author with a degree in elementary education, a fondness for road trips, and a terrible habit of forgetting where she's left her cup of tea. Her short fiction has been published by Fantastic Stories of the Imagination, Daily Science Fiction, Nature: Futures, and various other anthologies and e-zines. For more info, visit wendynikel.com or subscribe to her newsletter!